This is the period of time from your last meter read to your current meter read. FOR BALTIMORE CITY CUSTOMERS: If your bill is for a different period of time other than approximately 30 days, this may lead to a higher or lower bill. FOR BALTIMORE COUNTY CUSTOMERS: If your bill is for a different period of time other than approximately 90 days, this may lead to a higher or lower bill. Occasionally there may be situations that prevent the Department of Public Works from obtaining an actual meter reading. For example, meters are removed from the property during a water main relining project or something interfered with the transmitter and a meter reader could not access the meter. When this occurs, an estimated read can be used to bill the account. The estimate will be based upon the daily average usage. However, once an actual read is collected, any necessary adjustments and credits will be applied to the account. To determine if the meter reading was an “Actual” read or an “Estimated” read, please look at “Read Type” under “Meter Reading Details” on your water bill. Your water bill is calculated in CCF units which represents 100 cubic feet of water. 1 CCF is approximately 748 gallons. The average amount of water used by an individual is approximately 4 CCF per month (Baltimore City monthly billing) or 10 CCF per quarter (Baltimore County quarterly billing). This amount may vary for your particular household. Example: For a 2 person household, the expected average would be 8 CCF per month (4 CCF x 2) or 20 CCF per quarter (10 CCF x 2). Common causes for increased consumption can include having company visit (e.g., increased showers and toilet flushing, etc.) and warmer weather activities (e.g., washing cars, watering lawns and plants, etc.). Logging into the Customer Self Service portal and viewing the dates and times when consumption occurred or contacting Customer Support & Services for that information often helps property owners remember the activities that contributed to the increased consumption. To have an idea of how much water is likely used by your household in a day, the U.S. Geological Survey's Water Consumption Calculator is a good resource. Homeowners are only billed for the water that passes through their meter. 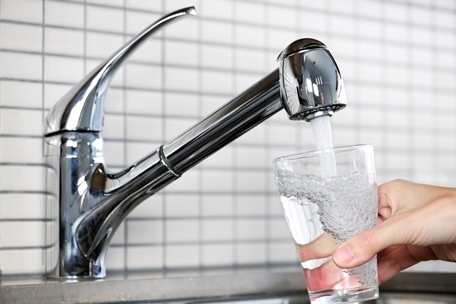 Other activities that may have taken place in the surrounding area such as maintenance of City main water lines or construction/repairs of water or sewer mains do not cause your water usage to increase. A leak that is the responsibility of the property owner to correct can result in high bills. Identifying and correcting sources of high water usage is an excellent way to reduce a water bill. It is recommended that property owners frequently inspect and perform routine maintenance on the most water-consuming appliances (e.g., indoor and outdoor faucets, toilets, hot water heaters, washing machines, etc.). Check for dripping faucets, running/leaking toilets, and leaking water connections. Even small leaks and drips can add up over time. 1 faucet that is dripping one drop per minute can add up to almost 3 gallons in a month. Running/leaking toilets have the potential for a significant amount of water loss. Underground leaks between the water meter and property structure can go undetected, can be difficult to identify, and can drastically increase consumption. A turn off test can assist in identifying underground leaks. Turn off the water coming into the house approximately 10 minutes before the top of an hour (e.g. 8:50 a.m., 9:50 a.m., etc.). Water shut off valves are typically located in a basement and on the wall that is in line with the water meter. Leave the water shut off until at least 10 minutes past the top of the hour (e.g., 9:10 a.m., 10:10 a.m., etc.). Log into the Customer Self Service portal the NEXT DAY and view the water consumption during the time period that the water was shut off. Contact Customer Support & Services the NEXT DAY and have a customer service representative view the water consumption during that time period. Contact Customer Support & Services to schedule a turn off test. Property owners will need to meet a meter operations representative at the property. For the test, property owners will need to Turn off the main water valve coming into the house so that the meter operations representative can observe water registering (or not) on the meter. If consumption DOES register on the meter during that shut off period, that is an indication that there is an underground leak in the water line somewhere between the meter vault and property structure. If consumption DOES NOT register on the meter during that shut off period, that is an indication that there is NOT an underground leak. If you have reviewed your bill, the information above, and still have questions on the amount due or the usage being charged, please do not hesitate to contact Customer Support & Services at 410-396-5398 or by email at [email protected]. Property owners can also visit the walk-in center at the Abel Wolman Municipal Building at 200 Holliday Street, First Floor Room 8, Baltimore, MD 21202.